Microsoft is officially launching its Xbox Live Creators Program which allows developers to publish their games directly to Xbox One and Windows 10. 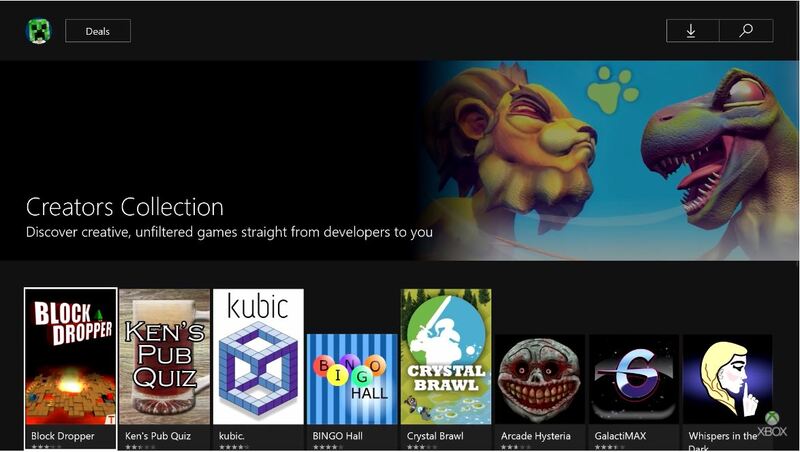 Nine games are available right now in a section called "Creators collection" in the Xbox Store. This is the latest push by Microsoft to increase indie development for the Xbox and Windows 10 platforms beyond the current ID@Xbox program. For starters, the certification process for Creators has been drastically simplified and requires no prior approval for concept. However, that also means that games in the Creators collection may not be to the same standard as titles that are created under ID@Xbox. Like Early Access games on Steam, developers will be able to release unfinished games for player feedback. Currently supported game engines include Construct 2, MonoGame, Unity and Xenko. The primary drawbacks to the Creators Program are that Creators collection games won’t get access to Achievements, Gamerscore or Xbox Live multiplayer as those features are only available under ID@Xbox. Retail Xbox One consoles can be used to publish games but those games must also be Universal Windows Applications so they can run on Windows 10. To get started, developers simply need to download the Dev Mode Activation app on their Xbox One. Some of the more skeptical among us may see this as an Xbox version of the dreaded Steam Greenlight program, which was replaced by Steam Direct earlier this year. Greenlight was plagued with crappy shovelware and the sheer volume of games released made it hard for any particular title to stand out. Still, the Xbox Creators Program is an easy way for hobbyists, small studios and students to learn game design and publish their games without having to deal with a rigorous certification process which could turn some away. It's also a good way for developers to test experimental game concepts with the public before committing to a larger release.